As the US Presidential campaign spiraled down down down down down down down this week, the media turned its eye to Trump University, as if this is going to be the big “gotcha” that derails Donald Trump’s campaign. (See: The Chronicle of Higher Education, The New York Times, Inside Higher Ed.) Former chief learning officer Roger Schank also weighs in. A New York appeals court also continues its scrutiny of the scam. More on that in the section below. Meanwhile, “Trump slams America’s schools in a rally: ‘Some countries you've never even heard of are ahead of the USA’.” “What Would a President Trump Mean for Education?” asks Frederick Hess. He says he has no idea but he wrote a column anyway. As one does. “Black students ejected from Trump rally” at Valdosta State University in Georgia, the USA Today reports. Google’s chairman Eric Schmidt “will head a new Pentagon advisory board aimed at bringing Silicon Valley innovation and best practices to the U.S. military,” the Defense Secretary announced this week. Gotta sell those military robots! And Chromebooks, definitely Chromebooks. “GI Bill funds still flow to troubled for-profit colleges,” Politico reports. A proposed bill in Virginia would require schools notify parents if students are assigned books with sexually explicit content. The Times Higher Education looks at the effect Catalan independence might have on higher education in the region. Via Education Week: “College Board Aims at Test-Prep Tutors in Barring March 5 SAT-Takers.” According to Buzzfeed, here is “Everything You Need To Know About The New SAT.” (Since the new test isn’t administered until tomorrow, I’m guessing it’s not everything you need to know.) “Why the new SAT is not the answer,” by Akil Bello and James Murphy. According to Education Week, the Justice Department is exploring how the College Board and ACT respond to requests for accomodations by students with disabilities. Via The Atlantic: “The Problem With the GRE.” The exam ‘is a proxy for asking “Are you rich?” “Are you white?” “Are you male?”’"
Northwestern University will eliminate loans as part of its student aid packages. Middlebury College has banned the sale of energy drinks, says Inside Higher Ed. “The U.S. Department of Education’s Office for Civil Rights has opened new investigations into alleged sexual violence at University of Notre Dame and University of Chicago,” reports Jezebel. Via Crain’s Detroit Business: “Wayne State medical school issues ultimatum to faculty”: Be productive! “The Massachusetts Institute of Technology and a student protest group have reached an agreement that will end a sit-in that has been going on in the administration building since October,” Inside Higher Ed reports. Dale Dougherty has returned as the CEO of Maker Media. The Chicago Public Schools will lay off 62 employees, 17 of them teachers. In turn, Chicago teachers might strike. Wake Forest University professor Melissa Harris-Perry walked off her MSNBC show. Former producer Jamil Smith posted a copy of her email to Nerdland staff to Medium. “The dean of Kansas University’s School of Social Welfare submitted his resignation Wednesday, after less than a year on the job, citing ‘daunting’ challenges at the school,” the Lawrence Journal-World reports. “The chief of the University of Cincinnati’s police force and a major in the department resigned on Friday as part of an outside review that was conducted following a fatal shooting last summer by an officer on the force,” The Chronicle of Higher Education reports. “Facing a $7-million budget deficit, John A. Logan College’s Board of Trustees approved 55 faculty and staff layoffs on Wednesday,” The Chronicle of Higher Education reports. No, researchers did not discover a Matrix-like way to upload learning into your brain, despite all the wonderful tech journalism that said so. “McDonald’s Is Now Making Happy Meal Boxes That Turn Into Virtual Reality Headsets,” says AdWeek, and I cannot wait for the McDonalds-Certified Educators to offer workshops on this at ISTE. There were lots of inaccurate reports this week that Google was launching a new “kid friendly” search site called Kiddle.co. It’s not a Google site at all (and appears to be run by the founder of freakingnews.com to give you an idea of how well it’ll curate “search”), but hey, why would we expect tech writers to research or verify anything before they hit “publish”? Edsurge has released its first AT&T-funded report on the trends driving the ed-tech market. Curriculet is moving away from a freemium model, but its “big changes empower students” (whatever the hell that means), says Edsurge. “Salesforce.org announces Higher Education Data Architecture,” says eCampus News. D2L has updated its Degree Compass course recommendation tool. “Cengage Unveils New Approach to Developmental Math,” says Inside Higher Ed. Andrew Hacker’s new book The Math Myth: And Other STEM Delusions seems to have renewed the debate on whether or not we should require Algebra II. Here’s Dana Goldstein writing in Slate. Here’s Anya Kamenetz reporting for NPR. Math professor Ketih Devlin responds, suggesting there’s a math myth permeating The Math Myth. Tech executives want to replace teachers with computers. Pearson also touts AI in education. Surprise, surprise. Mimio has been acquired by Boxlight Corporation. Terms of the deal were not disclosed. 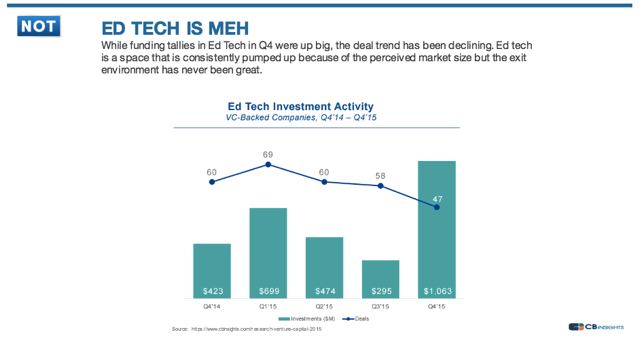 Here are my calculations about how much funding was raised by ed-tech companies in February. “According to initial results from recent pilot, digital game-based learning improved student engagement and self-efficacy in writing courses at 14 colleges and universities,” says Campus Technology. According to a survey of 4000 community college students, “about 50 percent of students reported having one or more mental-health condition,” The Chronicle of Higher Education reports. Via The Chronicle of Higher Education: “To Measure Teaching, Look to Health Care and Other Industries, Says British Think Tank.” There are so many flaws in a comparison between health care and education, but hey. I’m not a think tank so what do I know. Chicago-based LEAP Innovations has released a report on “what works” within its pilot network (that is, 15 schools in the city.) Among the tools it found to be effective was the literacy tool ThinkCerca. ThinkCerca is funded in part by Deborah Quazzo. (Remember the scandal about the companies in her portfolio seeing their revenue increase from sales to CPS? Anyway…) Quazzo’s partner at GSV, Michael Moe, sits on the board of LEAP, but Edsurge (also funded by GSV) assures us the organization has taken a “cautious approach” to this research. “Facebook AI Research is donating 25 GPU servers to European academies,” ZDNet reports. According to one survey, college students say they’re using the “hook up” app Tinder to find friends. Inside Higher Ed doesn’t buy it.